I’ve been told by one of my good knitter friends that I’m a tight knitter. She’s been telling this to me for almost two years now. I never believed her. Everyone who has seen my knitting has always told me how uniform my tension is – that it looks machine knit a lot of the time. I prided myself on good tension and having a garment that looked professional. 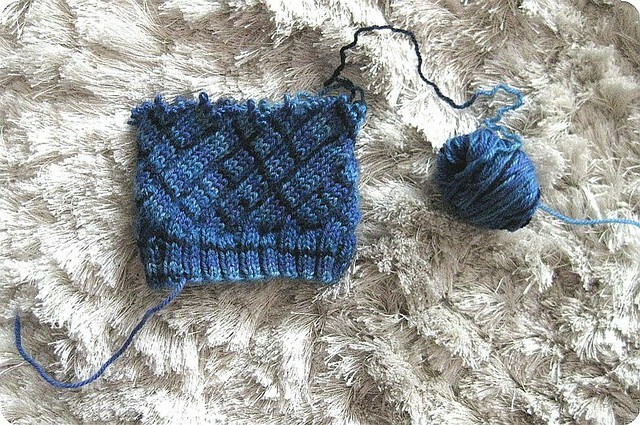 However, until just this past weekend, I did not realize that good tension does not equal (≠) tight vs. loose knitting. One can have good tension and be a tight (or loose) knitter. I did not know this. I was in the process of knitting an adorable swirl baby hat (Ravelry link only) to match the adorable baby sweater I made for my friend’s baby (Emily, see previous blog post) when I realized about ¾ of the way into the hat, that this hat wouldn’t fit a 2 month old. In fact, it probably would only fit a preemie. Now what went wrong? Well, I used 3mm needles when the pattern called for 3.25mm needles. I figured that 0.25 of a millimetre wouldn’t really make all much of a difference. However, when you factor in that I’m (ahem) a tight knitter, well, then I was left with an itty bitty hat that really wouldn’t serve my friend’s (or anyone’s) baby. And so I frogged the whole thing this morning on the bus going to work. This is the part of being a knitter that I try to just get to that zen place where I realized that yes, I royally messed up, but I’m gonna keep going dammit. I’m going to redo this hat on size 4mm needles. Perhaps a bit overkill on the up-sizing, but I ain’t gonna be foiled by my tight knitting again! Here goes round two… cue bell. You are currently reading Conceding defeat at When Gaia Smiles.